The search for dark matter has been likened to searching for a needle in a haystack. 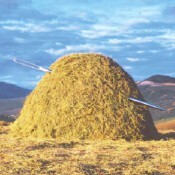 However, there's a great deal of dark matter to find so at least it's a big needle, albeit in a very big haystack! Our guide to this strange material was Dr Andrew Benson from Oxford University and the subtitle of his talk on dark matter hinted at the difficulties arising from "How to Study Something You Can't See." Back in 1933 the Swiss astrophysicist Fritz Zwicky observed a group of galaxies know as the Coma Cluster. He saw that the outlying galaxies were moving at speeds that meant they should have escaped the gravitational pull of the cluster s a whole and gone flying off into empty space. But they stayed in orbit about each other which led Zwicky to conclude that there must be some hidden mass somewhere. This extra mass would increase the overall force of gravity of the cluster and stop these outer galaxies from escaping. In fact he went on to calculate that nine-tenths of the matter in this cluster was invisible. Scientists have a range of theories to explain what dark matter is. They range from objects we already know about such as black holes to exotic new subatomic particles called axions. Following the subatomic route an experiment sponsored by the Particle Physics and Astronomy Research Council is taking measurements over a kilometre underground. Particle detectors situated in Boulby Salt Mine are looking for a new particle called a "neutralino". This is Europe's deepest mine and the detectors need to be located this far underground to escape the bombardment of cosmic rays from space. At these depths collisions in the rock stop all but one in a million of the cosmic rays. Recently a team led by researchers from Cardiff University has spotted what they term the first "dark galaxy". They used the Lovell Radio Telescope at Jodrell Bank Observatory near Manchester to map an area of the sky looking for hydrogen gas. To their surprise they found a large amount of mass that rotates like a galaxy but contained no stars. Their results were confirmed by the huge radio telescope in Aricebo, Puerto Rico. The 'galaxy' has been given the name VIRGOHI21 as it is found in the Virgo cluster of galaxies. If it were made up of stars like an ordinary galaxy it would be visible in a good amateur telescope. Dark galaxies are thought to form when the density of matter in a galaxy is too low to create the conditions for starbirth. The Virgo Cluster is the closest galaxy cluster to our own Milky Way being only 48 million light-years away. It covers the angular distance of five degrees across the sky (about 10 full Moons). It contains over a thousand visible galaxies and has such mass that it is actually pulling the Milky Way towards it. Naturally, the dark galaxies in its ranks are playing their part.